It’s time for another scintillating Hart & Usagi Podcast episode. We talk about DigitalTrends.com’s Top 25 SNES games article, the cancelled Jak 4, and we get excited for announced titles such as Mafia 3, Mirror’s Edge: Catalyst, and Dark Souls III. All this and more! * USgamer Community Question: Which is Best – Super Nintendo or Sega Genesis? It’s time for another scintillating Hart & Usagi Podcast episode. In this corner it’s USGamer’s 10 best PlayStation 4 games and in the opposite corner it’s two guys who played almost none of them. A captivating match-up! Other showdowns include Ant-Man vs. Pixels, UK businesses vs. personal use, and EVO vs. Jamie Lee Curtis. * What are the Hardest Video Games? On this edition of the Hart & Usagi Podcast we welcome back JiibayDan to chat about favorite controllers, 25th anniversary of the Genesis, and some hot Tetris pillow action. 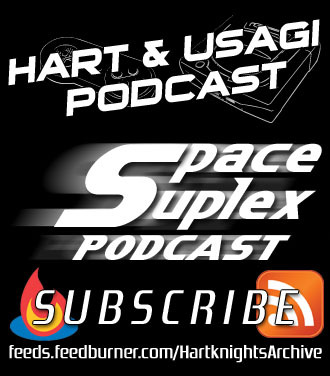 Enjoy the show and remember to subscribe and follow the Hart & Usagi Podcast today! * USgamer Community Question: What’s Your All-Time Favorite Controller? * Poll: What Should ‘Night Trap’ Have Been Rated? On this edition of the Hart & Usagi Podcast we talk about how awesome Platinum Games is and how much EA isn’t. We also give our thoughts on what being an “indie” game is. All this and more can be yours with a simple download of the episode below.